ISAMI DOI | Geringer Art, Ltd.
Isami Doi, an acclaimed printmaker and painter, was born on Oahu 1903 to Japanese immigrant parents. After growing up on Kaua’i, he attended the University of Hawaii for two years, and then Columbia University. He first studied science in preparation for medical school, then took law classes. Finally, in the Teacher’s College of Columbia he met the German artist Isaac Webber who encourged his interest in art. After exhibiting woodblock prints in New Your he returned to Hawai’i in 1928. Doi then spent a year studying in Paris before returning to New York. 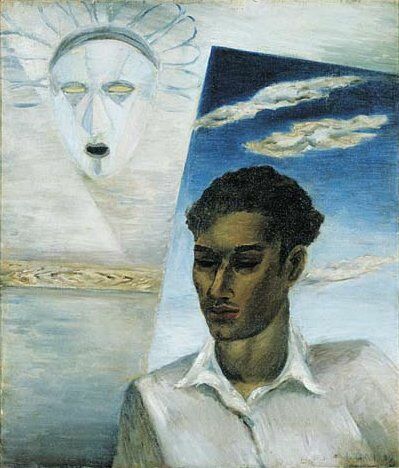 After 1938 he returned to Hawaii where he continued to make woodblock prints and also paintings. Doi taught printmaking, drawing, and metal work, as well as designing jewelry for the S. and S. Gumps store in Waikiki. Over time, his work increasingly approached abstraction, and featured Buddhist and Classical images and symbols. He also created personal symbols including hieroglyphs. He is credited with inspiring a generation of Hawaiian/Japanese artists including Satoru Abe, Bumpei Akaji, Jerry Okimoto, and Tadashi Sato. Isami Doi died in 1965.